Major General Abdel Nasser El-Azb, the Third Field Army chief of staff, announced on Thursday that security forces have arrested five militants involved in the bombing of the South Sinai Security Directorate. 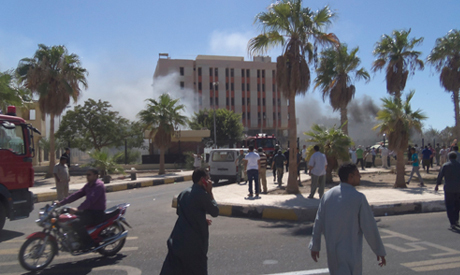 On Monday, the South Sinai Security Directorate in Al-Tor was bombed by suspected militants, killing three conscripts and injuring 62 others. Members of the militant cell involved in the attack were arrested after attempting to assassinate Third Field Army commander Major General Siyad Abdel Karim on Wednesday. On Wednesday, Ansar Beit Al-Maqdis, a Sinai-based militant group, released an online statement claiming responsibility for Monday’s attack against the southern Sinai security headquarters. The group has previously claimed responsibility for several militant attacks, including the bomb that targeted the interior minister's motorcade on 5 September. Hay!! Lady Ashton thinks you should free all these terrorists. Then she wonders why the violence is continuing. Are these islamic extremist militants really thinking they are helping their cause at all?? If thats what they think then their brains do not work because they are only making things worse. In my opinion this is a case for military trials & punishment. Civilian court is to nice for blood hungry terrorists like this. Between the militants, the mb & the rest of the islamic extremists they are doing a good job of showing the rest of the world that their religion is one of violence and bloodshed not peace. Such a shame a whole religion is getting a bad name world wide because of people like this.